...And there has been plenty of that around here in the last week! Having enjoyed a week of all things 'chickeny' it seemed my obvious choice of theme for today's post! The girls have been SO well behaved! After just three nights of having to pick them up and put them on their perch, by night four, when we got to their chicken mansion to put them to bed, they were already there! They are such good chickens! Anyway, having had some time to get to know them a little, they each have very different personalities. Babs has the most attitude, Frankie is the most curious and Marjorie is the most laid back. ... Or so I thought. But on two occasions, whilst drawing the feather I looked up to find that it had fluttered to the floor in the breeze from the open door! I was almost disappointed to have completed the sketch as quickly as I did! However, whilst I had been happily scribbling away, Paul had made his way down to the Coop and retrieved a lovely fresh egg, still warm, from Frankie, who is firing out eggs like there is no tomorrow! She has given us seven eggs in seven days so far! I decided that I would sketch the egg to go with the feather. I know that an egg is hardly a challenge, but it is SO easy to forget how much fun it is to just draw. There is no pressure involved, no worrying about the result, nor if people will like it, its just drawing - and I do SO love that, and I forget just how much until I actually do it! Aside from this, let's not forget just how important it is to keep drawing! Art is an illusive thing and it's all too easy to let other things get in the way and before you know it, it might have been a month since you picked up a pencil. And oddly, it's not like riding a bike - If you don't keep it up, you do go rusty! A very talented Artist once said to me that there are plenty of artists out there who can paint, and yet they can not draw. Someone who doesn't practice art may not understand that, but those of us who do, will. Recently, I have been so wrapped up in long-winded paintings, that I have been neglecting the very fundamentals of drawing and for this reason I am planning to be doing a lot more basic drawing over the next few months. Sketching is one of the most important things an Artist can do and yet why is it that I will make every excuse not to do it? Just look at this charming sketch by John, at J.W.J. Arts . Aside from the hilarious narrative, I just LOVE looking at sketches like this - and yet I rarely do them myself! I need to change this and start to embrace the simple joy of sketching, just for fun. Lovely sketches, [and chicken observations] Sandra. And you are So right about the importance of sketching. Sandra, I love these paintings. I think they would make a lovely series:) And I love your egg, not so easy for everyone. I need to sketch more, but I have always found having a sketch book frustrating. The perfectionist in me is never happy to just have a sketch, I always want a finished piece. Sandra these drawings are LOVELY!! That feather looks so real! And you've captured the form and shape of the egg perfectly. I don't think drawing an egg is easy for everyone, you've given this depth and life, and that's not easy at all! :) I'm loving your chicken inspired art ventures, and the stories too. And I totally agree with you about drawing. It was something I had been neglecting too but recently made friends with my sketchbook (I sketch in the car while I'm waiting for my kids to get out of school!) again and I'm so glad I did. I'm like you, I LOVE to draw. How easy it is to forget that? Loved this post Sandra. Enjoy the rest of your day! Your feathered ladies are providing you with lots of drawing and painting material! The feather and the egg are perfect! And not easy at all. Love it! Sandra, you must have an incredible amount of patience to sit down and paint every little fibre in a feather so perfectly like that! I would have lost the will to live before it was anywhere near finished. You are right, it is essential to keep your painting and drawing hand in, especially when you get to my age, where you sometimes forget the basics if you haven't done any work for a while. Also, I too have done one or two smaller works recently that I finished quite quickly. This helps to raise your spirits when you start to get bogged down with the bigger works. 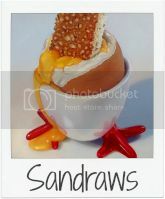 perfect egg sandra... beautiful soft feathers enjoy your hens ! Sandra, that feather is fabulous, and as for the egg ... the blending from the dark tones to the highlights is just perfect. Very skilfully done. I agree with you wholeheartedly about the sketching and thank you very much for mentioning my recent post. It's greatly appreciated. Both paintings are very beautiful become. Especially the spring is very nicely detailed. Hi Sandra, nicely rendered Feather. 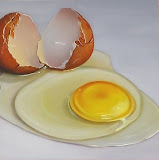 Eggs are excellent practice and a faithful friend of the old masters too. You can find egg shapes with their respective light, mid-tone, dark and reflected lights all over the figures of Raphael, Michelagelo and Durer to name a few. You are right about drawing, if we can draw something from life everyday, we will soon be experts. An artist can be a master at handling oil paint but if he/she can't draw, there will be trouble because drawing errors will go unnoticed and the painting will fail. Glad your chickens are doing well, they sound hilarious! very beautiful pen and egg! I so agree about sketching! It is a beautiful practice that artists should always engage ourselves in. However, as an artist, I find it difficult to do at times. I have made several efforts to change this...for real! I am thinking that I am going to re-evaluate things and really make an effort to do it this time!!! Your feather and egg and amazing ! I love the feather and the egg. Both are difficult to draw well and you've succeeded so well with both. Eggs are such perfect drawing challenges. People think they're simple, but to learn shading techniques, they're the perfect subject matter. And you're right drawing skills are the skeleton of everything else in art. I just enjoyed this post and the photos so much. Thank you so much for taking time to make such a lovely post..
one does forget the delightful the simplicity of a drawing can be, you are so right. and it inspires me to pick it up again, thank you sandra! these two amazing drawings, due in no small part to their narrative are simply perfection!! your drawing skills are exemplary and both the feather and the eggs exude so much personality i can hear them speak! bravo! great subject matter and i am so enjoying the progress of the chickens! sandra, i love this post. i love that you are keeping chickens and that they each have their own personality. i recently turned vegan because of the horrible treatment of even free range chickens but if i had the space i'd love to keep a few so i know they're getting to do what chickens are meant to do! as for your sketches-they're amazing and so realistic. you are so right-i don't sketch nearly enough and i really need to do more. its so easy to get out of the way of drawing regularly and it is something i don't do enough of-you've inspired me to try some still life compositions. Frank - Thank you! The feather didn't take more than about 25 minutes. I really didn't draw every single fibre at all - there is no way I'd have the patience for that either! Though it looks that way, it really is just an illusion helped along by the blending of suprisingly few strokes! I have painted feathers from time to time mainly ones lying on beaches but never ever with such wonder as this. I beg your pardon, but I have two questions to do to you: what kind of paper you used for these drawings? And you made them with pencils or pastels? Thank you so much! Cristina - Thank you!! Well, I am not so good at painting like you! Happy chicken days! Your sketches are beautiful. I especially like the beige paper you sketched on. These are so frameable! Your feather and egg and wonderful! I wouldn't call them sketches, I would call them paintings! I like the way you made them stand out against the plain background, it makes them seem so precious and special, which they are! You are such an inspiration, Sandra. I love this egg and feather! I tried to sketch an egg but its not easy. Your shading was perfect...Awesome feather! !